Hot Water Beach is a beautiful surf beach. At low tide, hot water bubbles up at a particular place in the sand and you dig yourself a "hot pool" to bathe in. When the water is too hot, take a swim in the Pacific! Our home is only 150 metres from the sea so you'll hear the gentle noise of the waves in the background of native bird calls. 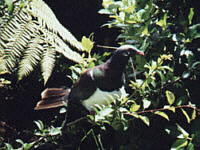 When you're lucky, you'll see the Tui and wood pidgeons flitting from tree to tree. 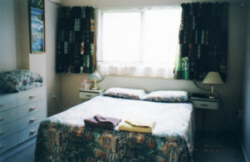 We provide two comfortable apartments with bedrooms, private bathrooms, private lounges, TVs and kitchens. 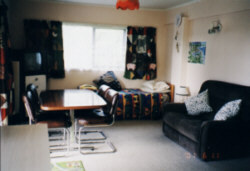 Tea, coffee, cereal, bread butter and jam are in units and guests prepare their own breakfast to suit their own needs and desires. We have a lovely cafe only "2 doors" away. 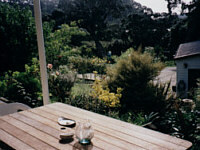 Your hosts, "Auntie Dawn" and Joe, enjoy gardening and relaxing amongst giant pohutukawa trees -- New Zealand's "Christmas trees" for their brilliant flowers which appear in late December). Joe also likes making home brew beer. We have a small dog, "Jock," who is but one of the family's pets -- you'll see our hens 6 brown hens called Milly, Molly, Mandy, Ping, Pong & Po in the small orchard behind the workshop/garage. 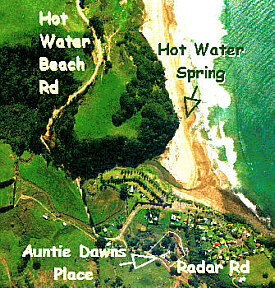 Directions: SH2 to (exit 477) onto State Highway 25, through Tairua to the Hot Water Beach turn off at Whenuakite and follow the signs toward Hot Water Beach (bear right). Two hundred metres before the Hot Water Beach shop, turn right into Radar Road. A phone call would be appreciated.